Although, quite clearly, I love making raw cakes, if there’s one dessert I miss the most it’s got to be a baked New York style cheesecake. I’ve been trying to perfect this recipe for a little while. I wanted it to have the taste and texture as close to the original thing as possible, but to keep it as inclusive as possible for those of you with allergies and intolerances. This version is gluten free, vegan, refined sugar free, low fodmap (in small portions) and nut free. As well as that, unlike my other nut free cheesecakes, this doesn’t contain tiger nuts so you don’t need a Vitamix or a good quality food processor to get the job done. As long as you’ve got a blender, you can make this without any bother. The secret ingredients in this dish is silken tofu. Don’t worry, I promise you won’t taste it. 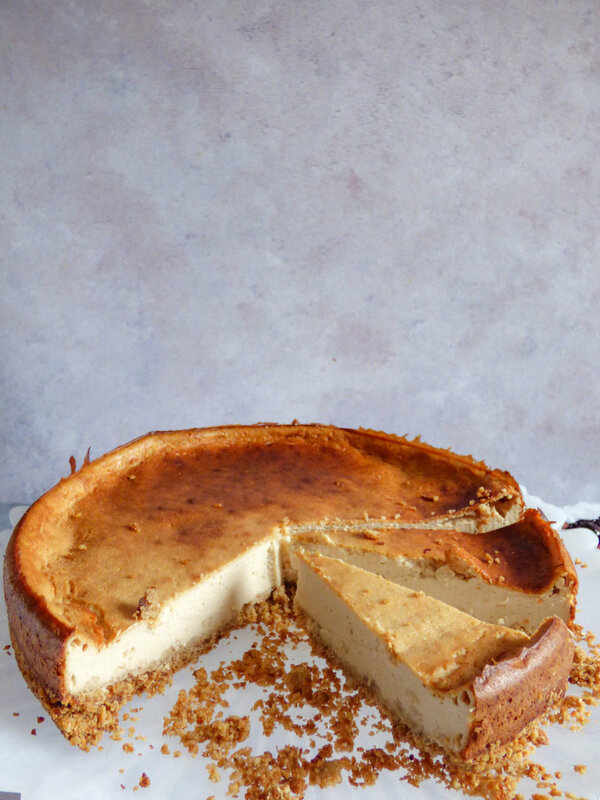 But to create a vegan cheesecake that’s nut free you have to get a little inventive with your ingredients, and silken tofu is the only type of tofu with the right texture to make this work. Now, unfortunately for me, and perhaps you too, out of all the types of tofu, silken tofu is not low fodmap. However, a 1/4 cup serving size should be tolerable to most people. As this is a big cake and can serve up to 12 people, this hopefully won’t cause you any trouble. Just be mindful if you know tofu is a symptom trigger for you. Sorry to any of you who are unable to eat tofu at all, as well as gluten, dairy, certain sugars and nuts. I have lots of other dessert recipes that work for you. 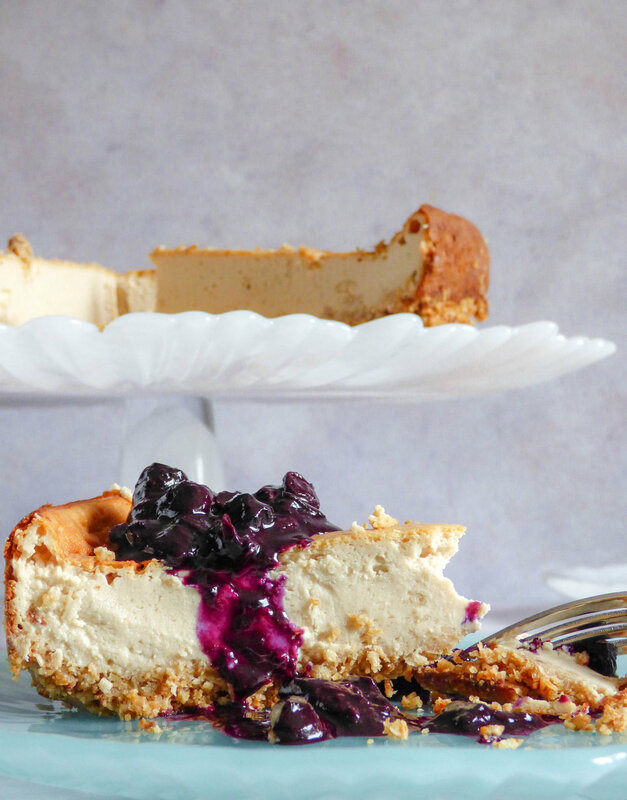 I really hope you love this recipe as much I do, and if you miss a good ole slice of New York style cheesecake, you don’t have to miss out any more. Preheat the oven to 160°C. Grease and line a 9 inch spring form cake tin. Melt the coconut oil then mix with the rest of the base ingredients. Press firmly into the bottom of the cake tin, making sure it’s evenly distributed. 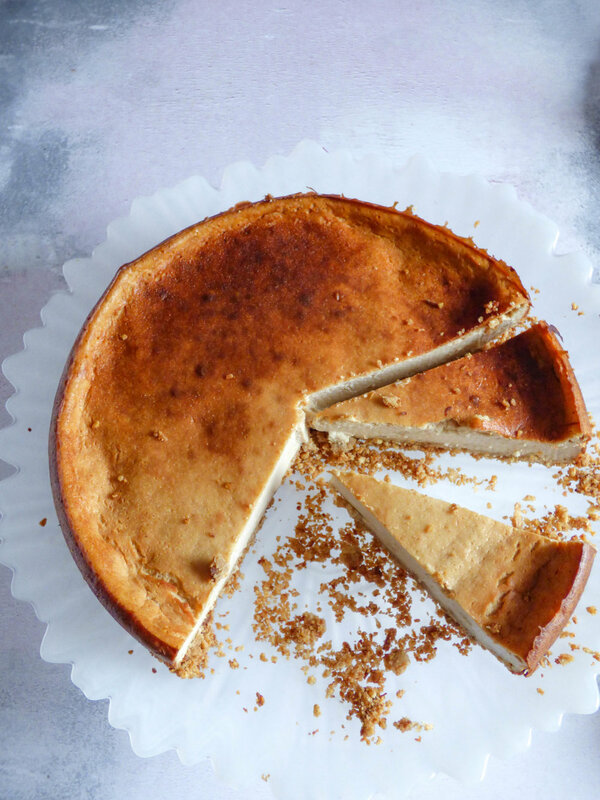 Pop this into the oven for 10 minutes while you make the rest of the cheesecake. After 10 minutes, remove the cake tin from the oven and set to one side, then turn the oven up to 180°C. Mix the corn flour and milk in a small bowl until smooth. Then add this, along with the rest of the cheesecake ingredients to a high speed blender and blend for a minute or so until it is completely smooth. 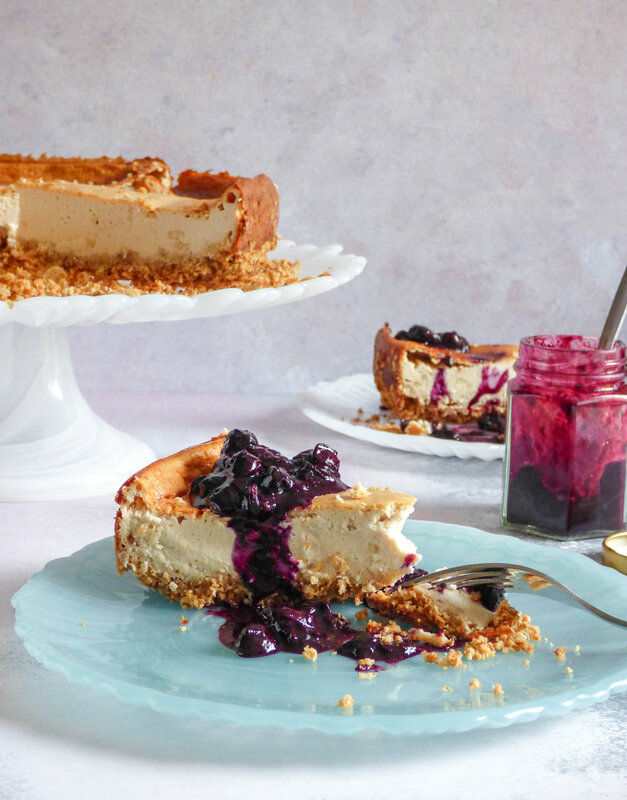 Pour the beautifully, smooth and creamy cheesecake mix over the base, give the cake tin a shake and smooth out the mixture. Pop it into the oven for 50 - 60 minutes until it’s lovely and golden brown or until a skewer inserted to the centre comes out almost clean. Don’t worry if there’s a little residue on the skewer. Note: check on the cake after 40 minutes, if it’s browning a little too quickly, loosely cover with a piece of tinfoil until it’s cooked. Once it’s done, remove from the oven and allow to cool completely at room temperature. Then, cover with cling film and pop it into the fridge to chill and set for at least 4 hours, preferably overnight. Serve with a blueberry compote, fresh berries and/or a dash of dairy free cream. Add two large handfuls of fresh or frozen blueberries to a pan with a splash of water, cover and place the pan over a medium heat for a few minutes. Remove the lid if the liquid starts to bubble up, before it has the chance to bubble over. Stir occasionally and simmer for 5 - 10 minutes or until the blueberries have popped and have turned deliciously syrupy.